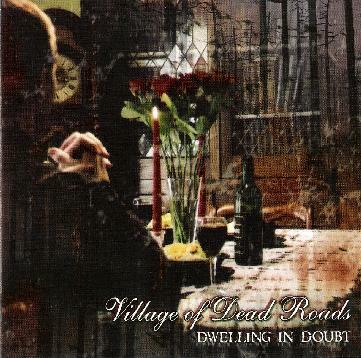 Village of Dead Roads - "Dwelling In Doubt"
This US band previously released a split CD with Spiritu on the Meteorcity label but this is their first full length record. Quite cool artwork on this CD and some pretty killer riffs and vibes, but too much of the screaming death vocals and not enough of the nice voice. The opening track (Fugitive) has a killer riff and I like the intensity that the organ gives the track. It is cool that all the tracks on this CD were recorded live in one take. The CD contains the main tracks but then is interspersed with shorter tracks around 1 minute in length. The band for sure has some monster riffs but I tire of the shouting angry vocals (a lot like Carnivore, remember them???). Blind Albino is one of the moodiest songs on the CD and has some intense lyrics. Between Grace and Delusion is a powerful number and has the atmospheric qualities of post rock the way the guitar sound is during the melodic start. This is a CD you have to hear a few times to get into. I really liked the tracks on the split CD with Spiritu but this CD has some great stuff to offer as well. Godflesh meets Carnivore meets ISIS. Eat it up! For more information you can visit the Village of Dead Roads web site at: http://www.myspace.com/villageofdeadroads. Visit the Meteor City web site at: http://www.metorcity.com.